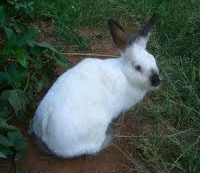 Lately, people here and there have very quietly taken up rabbit raising, first for home use, then for sale. This movement, undertaken to supply an actual need for meat, is fulfilling expectations. City and suburban dwellers are raising rabbits in back yards. Although the total production is yet comparatively small, it is steadily increasing. In certain localities in California, Oregon, Washington, Colorado, Kansas, Missouri, Michigan, and several other States, the domesticated rabbit is recognized as a regular meat animal. Rabbits are either shipped alive to market in crates or are neatly dressed ready for cooking and packed in a sanitary manner for transportation. Body Type: Fur is black with silver white hairs throughout coat. Body is of medium length, well-rounded. Head rather narrow, eas medium-long and erect. Special Care: Temperament is generally calm. Weight: 8 - 10 1/2 pounds. 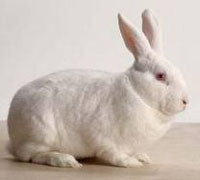 Body Type: White with black ears, nose, feet, and tail. Full-bodied with medium-length upright ears. 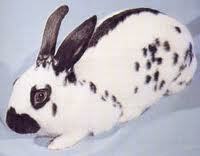 Body Type: This unusal rabbit has a coat that changes gradually from black when very young to silver when adult. Body is medium length, full and round; ears are long and erect. 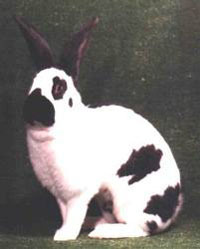 Body Type: White with spots of black or blue on the nose, check, back, and hindquarters. It has a racy type body with an arch to the back. The head is relatively large; ears long and erect. Special Care: Some rabbit owners claim this breed takes extra care becuase the racier body is more prone to injury and the large size makes handling difficult. Not for a first-time rabbit owners. Weight: 6 - 8 pounds. Body Type: Racy body, long erect ears. Butterfly mark on nose, check spots, line down the back, and side spots are colored, body is white. Special Care: Some people claim it has a rather nervous temperment. Body Type: Massive long body, ears long and upright. Fur is black, blue, fawn, light gray, sandy, steel or white. This rabbit takes strength to handle. Weight: 5 3/4 to right pounds. 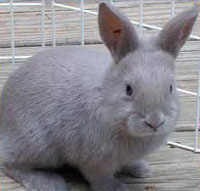 Body Type: This rabbit is dove-gray with a pinkish tint. It has a medium-sized body with a somewhat narrow head and medium-long erect ears. Body Type: Fur black, red or white. Body is medium sized and well rounded. Ear are medium-long and upright. 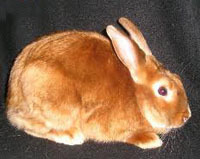 One of the rabbit breeds often used in laboratories. 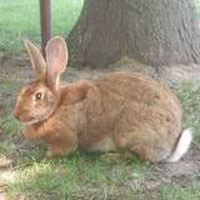 Body Type: This rabbit has beautiful fur of a golden or lynx color. Body meduim-length, ears medium-long and upright. Weight: 8 to 10 1/2 pounds. 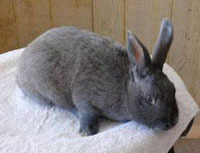 Body Type: The coat of this rabbit is dense, soft, and has a sheen to it. It has been bred in many colors. The body is medium-long and erect.